After 4-5 hours we finished roughly 50% of the sanding needed. I am still debating whether I should remove and replace the cross-beams supporting the cabin floor. However, first thing first – more sanding. Below are some photographs after today’s debauchery. 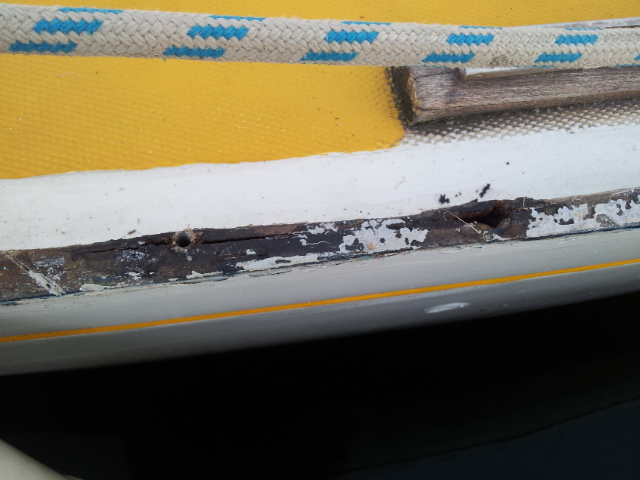 Yesterday I started removing the old cabin floor which started to disintegrate. I could not find any prominent rot so I concluded that the plywood simply could not survive the strain of constant wear and tear. This is because the underlying structure did not adequately support the cabin floor. 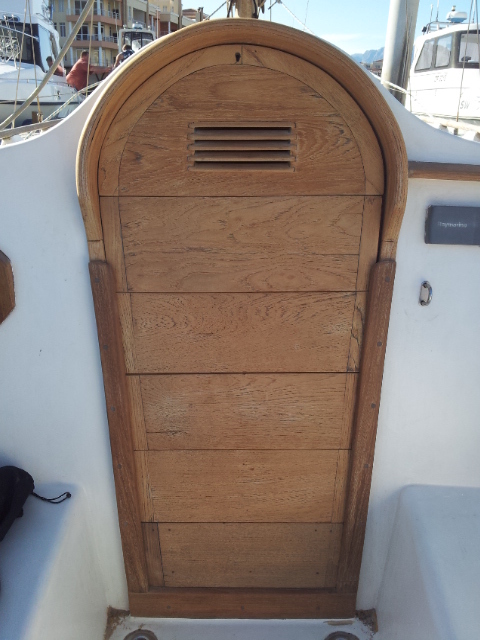 Above: The old cabin floor, looking into the bilge. 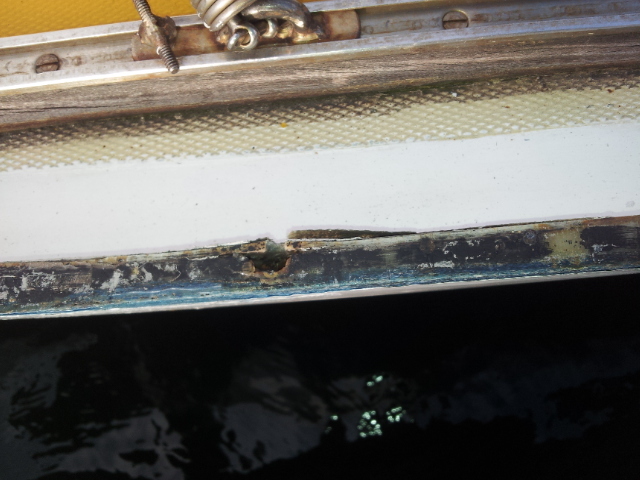 Below: The bilge after the cabin floor was removed. 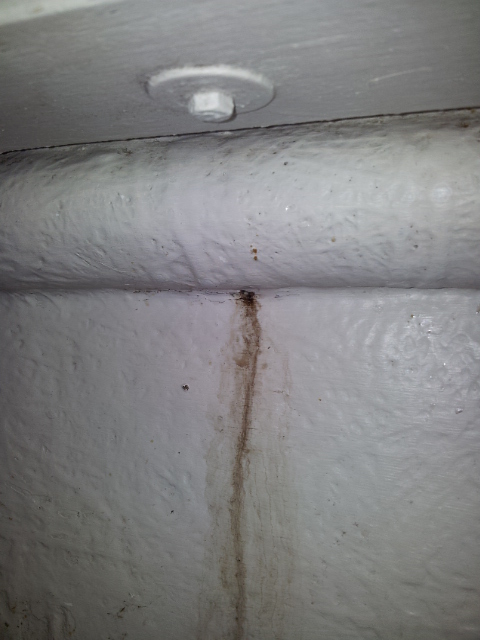 Note all the dust and gunk that accumulated below the floor. Below: Some plywood that was removed. 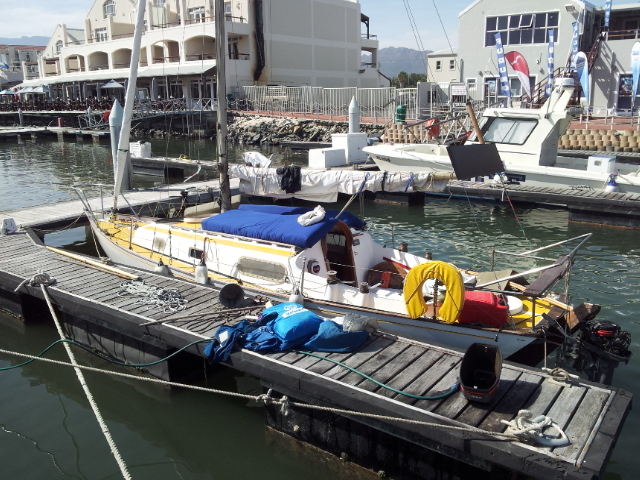 The large piece is from the starboard bunk and is still in good condition. Below: The old engine bay, with the position of the old engine mountings still visible. 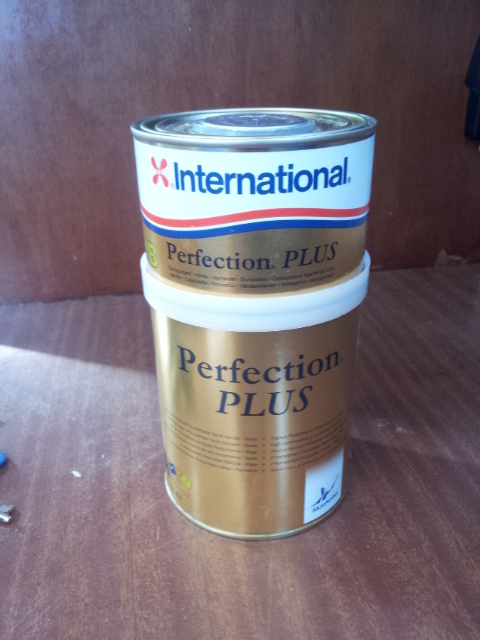 I hope to sand the bilge and floor this week after which I will give it 2 to 3 coats of hard-wearing enamel paint. 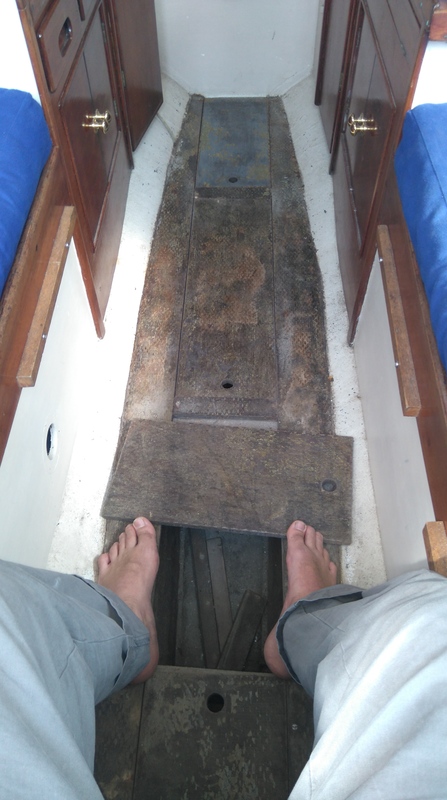 Additionally I plan to build up the supporting structure with plywood and epoxy after which I will install 18mm marine ply for the new cabin floor. 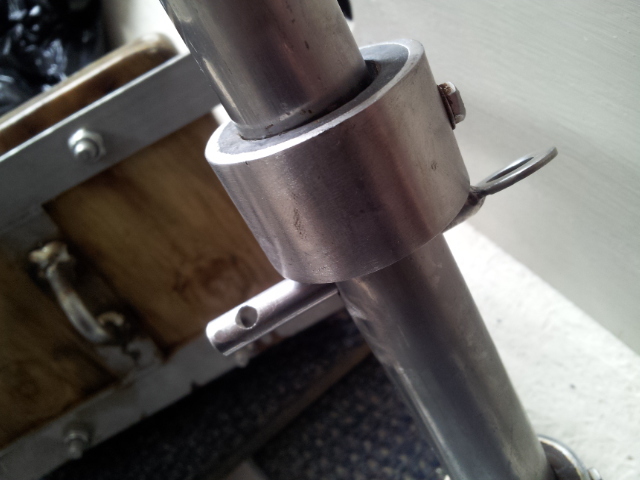 After two months I got the outboard bracket back from the Stainless guys. 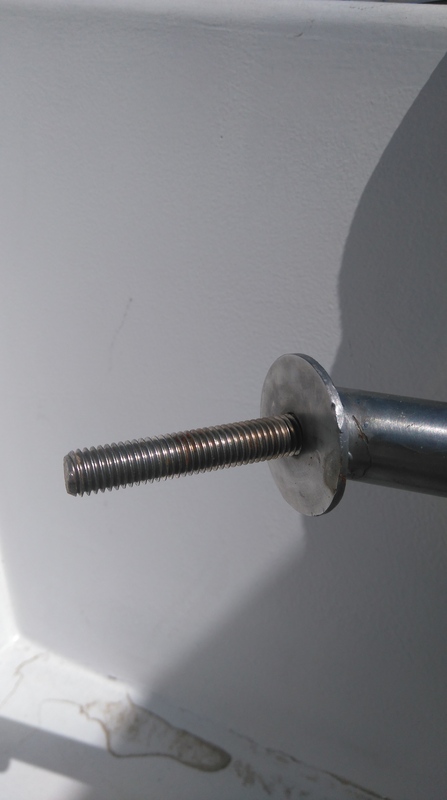 The initial design of the bracket had two mayor flaws: the first was the thickness of the bolts used to attach the bracket to the transom and the second the ability (or lack there of) to keep the outboard set at different heights. 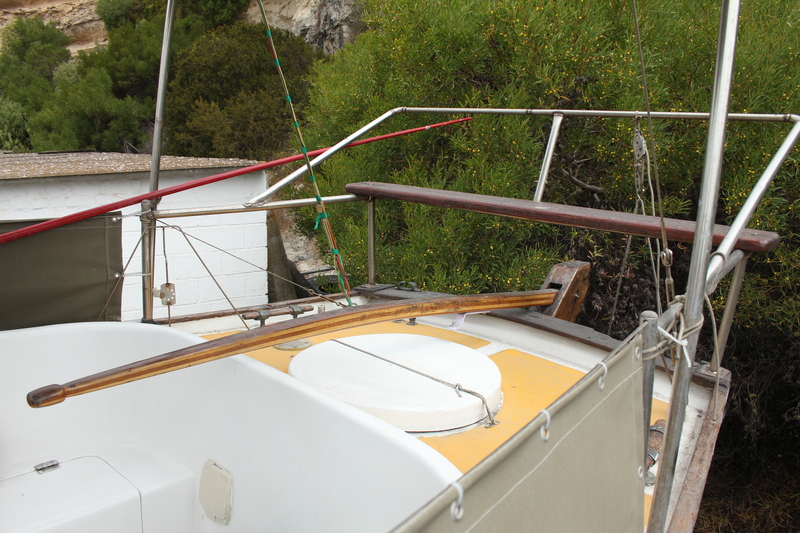 The outboard is mounted on a sliding mechanism which was held up by a line fixed to the stern rail. Not only was this highly inefficient and difficult to work with, it was also dangerous. 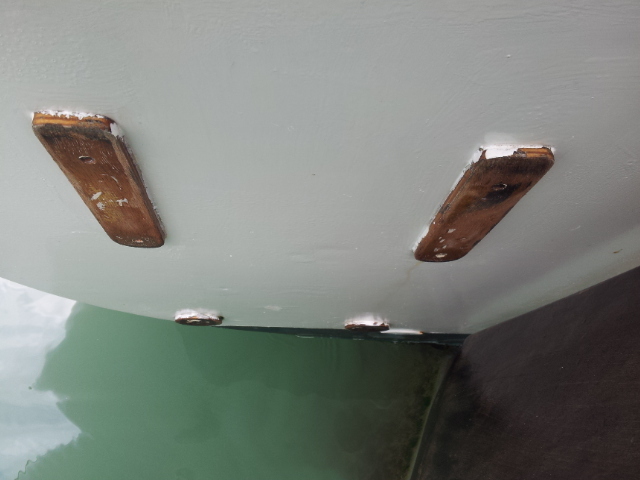 I therefore had the old bolts replaced with 12mm stainless bolts and had holes laser-cut so that I can adjust the height of the outboard by inserting a “key” in the new holes. I have had some time to experiment with this and it seems to work much better than before. The current state of the cabin floor. 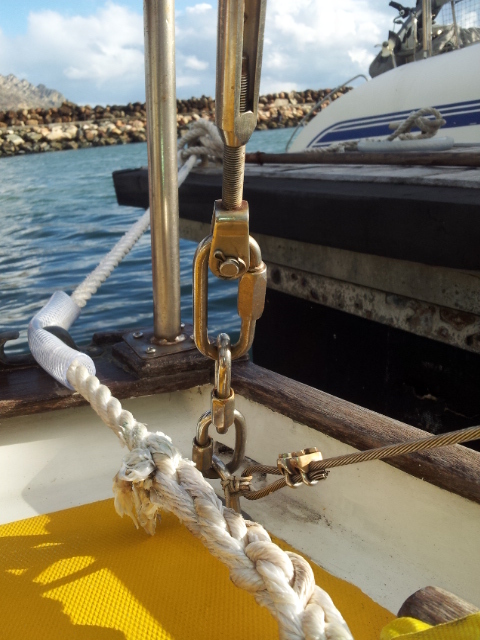 Motoring off the coast of Noordhoek. I have decided to have a new stern rail build since the old one looks a bit rough around the edges (pun intended). I really like the current design where there is a seat incorporated for one to sit on when operating the outboard motor. From this seat I can easily adjust speed or kill the motor while steering the tiller with my feet. 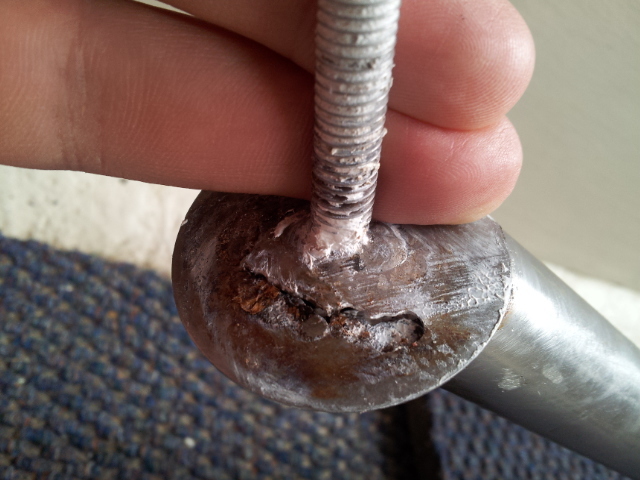 The only down side, however, is the poor level of workmanship that went into the construction. 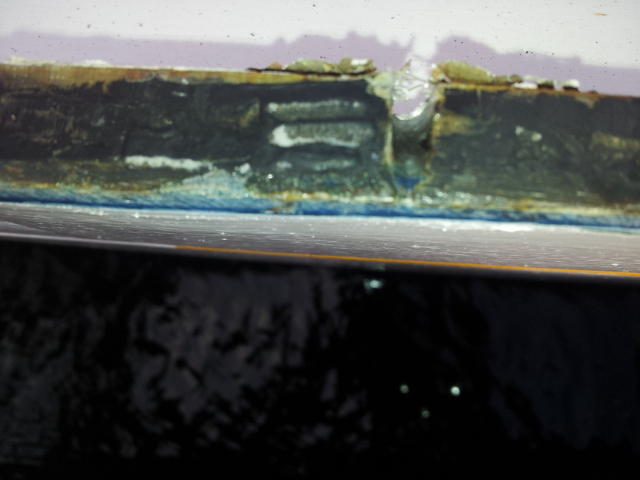 Below is a photograph (taken during the initial survey in April) of the current stern rail. Using Google SketchUp and some measurements I took this morning in 35knots of wind I came up with this design. This is only my first draft and all measurements are still to be finalised. Hopefully I will have quotes for the new stern rail by the end of this week. 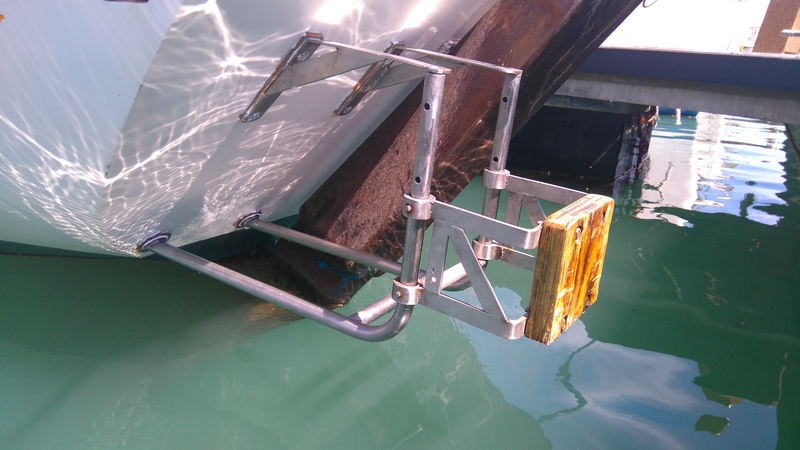 I am also busy with a refit of the outboard bracket which I want to get installed as soon as possible so that I can go sailing again. I will definitely write a post on that as well in the near future. 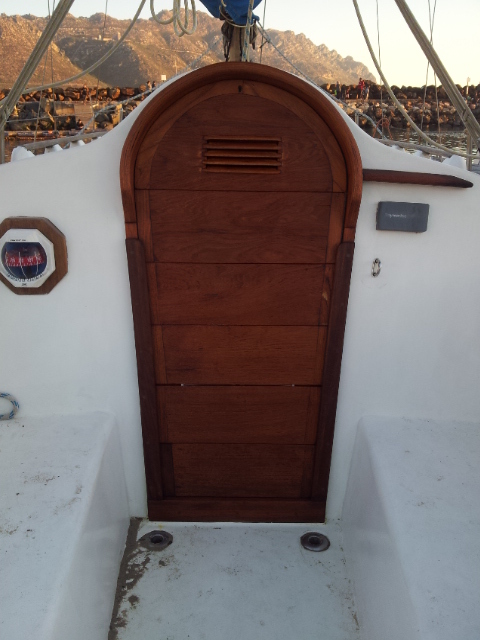 Finishing the Companionway and Washboards. I have been planning on varnishing the companionway and washboards for weeks. However it seems that I won’t get a decent enough weather window since cold fronts keep rolling in and the temperature stays in the 12 – 16 degrees Celsius range. The varnish I bought needs at least 25 degrees Celsius and at least four coats applied over two or three days. I therefore decided to apply raw lin seed oil instead and I must say I am very pleased. 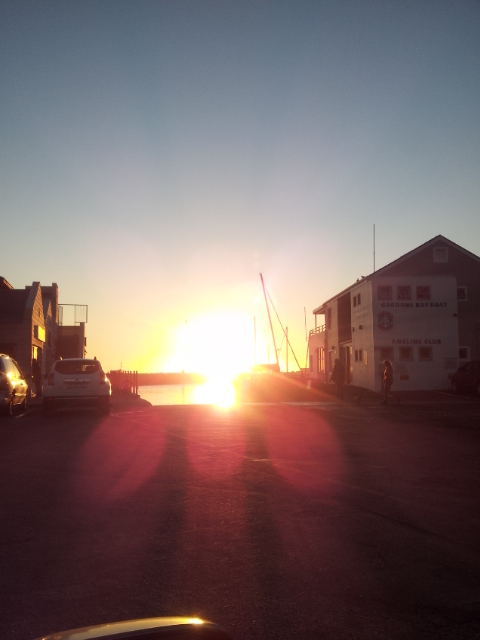 Apologies for the bad light, the sun was setting just as I was taking the picture.